Bread from the Garden! | Delicious! Delicious! The sun is just beginning to brighten the morning sky. Green herbs are spilling over the sides of little pots that line the porch. Caryn sits with her coffee and a pair of kitchen shears. She bunches together some oregano sprigs in her hand. If I don’t clip you now, you’ll take over the porch by the time I get back. She snips the oregano and drops it in a little paper bag. Punky sits behind the screen door, meowing for his breakfast as Caryn moves on to the rosemary. The curtains are all pulled tight against each other, keeping out any hint of the sun. The trash can by his bed overflows with tissues and dvd’s are scattered about the floor by the television. Mr. R. is awake in bed. Caryn enters with a plate of just toasted bread, a butter pad sliding off the crust as it melts. She puts the toast on the nightstand and begins to straighten the room. I can smell the herbs in it. Mr. R. pulls apart the toast and eats. Caryn shoves the tissues back in the trash can and picks it up to empty it. I bet you never thought you’d be playing nursemaid at this job. No, I guess not. But I’m glad to see you’re feeling better. She opens the curtains just enough to let some light sneak in. I am feeling better. In fact, I’ll take more of this bread. Of course. Lauren will be so thrilled to hear that you’re recovering. She leaves with the trash can as Mr. R. growls and smushes the pillow up to his face. This loaf is slightly dense and thus, holds up nicely to the rosemary. Substitute whatever fresh herbs are available to you. It’s a great bread for sandwiches. 1. Dissolve yeast and sugar in water. Let stand until foamy, five minutes. 2. In heavy-duty, stand mixer, blend olive oil, salt and 1/2 cup of flour until a thick paste forms. Slowly add yeast mixture and 1 cup of flour. Mix until smooth. Add herbs and 1/2 cup of flour. Switch to dough hook and add remaining flour by spoonful until dough pulls away from sides. Knead until elastic, about 8 minutes. Resist the temptation to add more flour. The dough will be very sticky. 3. Scrape dough into a well-oiled bowl with a spatula. Turn to coat. Cover and let rise 1 hour or until doubled in bulk. 4. Turn dough onto lightly-floured surface. Let rest five minutes. Shape into a loaf and put into a lightly greased 9×5 loaf pan. Cover and let rise until dough nearly reaches top of pan, about 30 minutes. 5. Preheat oven to 350. Bake loaf until golden and the bottom sounds hollow when tapped, about 50 minutes. Remove loaf from pan and cool on wire rack. 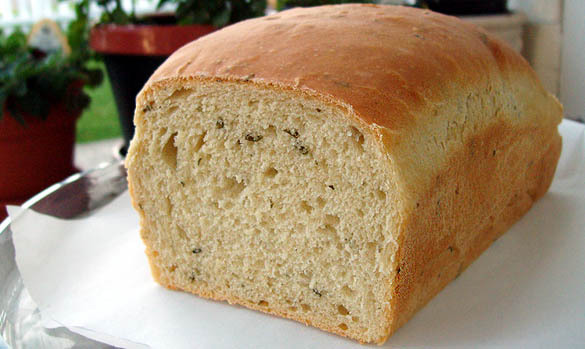 The loaf looks divine, thanks for the recipe, I can’t wait for my fresh herbs to be ready to make this loaf! Thanks for this great recipe,I baked it today. Laurie, my garden is now overflowing with herbs. I can’t get rid of them quickly enough! Chanit, I hope the bread turned out well! Homemade breads have a shorter shelf life than store-bought, so eat it quickly! Sure…Caryn,i knew that matter of ‘shorter shelf life ‘.. so we ate some, and the freezer ate some too.! The baking pan you need:The Oven large baking sheet. 1. Dissolve yeast and sugar in water. Let stand until foamy, 10 minutes. blend 2 kinds or flours and set aside. 2.Blend in 2 kinds of flours,salt & oil. 3.Knead until elastic, about 8 minutes. 4.Put in a large bowl ,covered and let rise about an 1 hour. 5.Punch it down and knead for few seconds. 6.Cover and let rise for 30 Min. 7.Devide the dough into 2, shape to 2 loafs and put into the big oven pan. 8.Cover and let rise in a warm place (on the stove)for 30 minutes . 10.Bake the loafs for 15 minutes,then reduce the heat to 200C, and bake for 25 more. 11.Remove loafs from pan , cool on wire rack.